“Make Four Times The Profit From ALL Your Webinars..."
Take Action - SignUp Now! Imagine you’re about to deliver a webinar for an absolutely killer product. You’ve got the pitch. You’ve practiced. You know it’s going to convert like mad, and you’ve got hundreds of registrations. But when it hits 8PM EST, only 150 people show. It’s not a problem with your pitch. It’s a problem with time. 8PM EST is 1 in the morning in Europe, and all your customers are asleep. In Australia, it’s 10AM and they’re all working at the 9-5. You can’t be in more than one place at any one time! But just imagine if you could. Promoting just two products, RepWarn, & Incredible Dream Machines - we managed to generate a massive amounts of sales. Webinars - Allow You To Sell Anywhere, Anytime. You see, we all know that Webinars are the best and quickest way to earn HUGE profits. Because they add hundreds - even thousands to your bottom line. Which means that you can use them to sell higher ticket products more successfully, when an email just wouldn’t suffice. Enabling you to bring in bigger profits quicker than any other method. So Webinars = Money Making Awesomeness. And the more money you make. Problem: They Are majorly time consuming. And most importantly, their time-zones. If you want to deliver webinars to all of your customers, you HAVE to deliver them on a time zone that suits ALL of your customers. And this isn’t physically possible. Unless you deliver your webinar, twice, three, maybe four times. Because this is going to interfere MAJORLY with your lifestyle. BUT, I know you’re NOT going to want to sacrifice the massive income webinars will bring you. You only make one set of profits. You make 4 times the profit. More webinars = more money. 4 Showings = 4 x The Cash! Just imagine if you never had to miss out on a single sale from your customers, no matter where they are in the world…and you only had to record your webinar ONCE…. And just imagine if you could run more webinars more often. And still only have to record them once. What if you could double, triple or quadruple your profits? Heck, what if you could even make thousands of dollars with your webinars, whilst you’re out for dinner with your family. AND generate 4 times the profits. The All Inclusive Evergreen Webinar Replay System That Fits Into Your Lifestyle. In Literally Just A Few Clicks You Too Can Create A Video Replay Sales Page And Have It Generating Masses of Leads And Sales. Market More Often. Market To More: Increase the reach & frequency to market to subscribers anytime from anywhere. Show More. Sell More: Increase sales by selling to more people more often with our smart relay technology that empowers you to automatically deliver multiple showings throughout any 24 hour period. & Turn It Into An Evergreen Webinar. With Your Affiliate Link! Webinar Alpha provides an all inclusive evergreen video conferencing experience, with no need to download or install anything. There’s no need for Wordpress or plugins. Webinar Alpha empowers you to do more frequent webinars that don’t interfere with your lifestyle. You can record them in advance, with ZERO limitations then run them as LIVE and no one will EVER know. Set up your evergreen machine with our ‘matinee’ system - allowing you to schedule complex repeating patterns of webinar replays on daily, weekly and monthly cycles. Simply paste a You Tube URL and legally hijack ANY offer on You Tube with your personal affiliate link! Reach every one of your customers, no matter their time-zone and still only record it once! Genuine Engagement: Adaptive Scarcity, Availability & "Buyer Mindset" technology means that each viewer gets a unique experience suited to them. More Exposure: Allow anyone to view, anyone to chat. Or optin gate viewing & / or chat. Use Any Video: No need to even upload your recorded webinar videos. Simply copy and paste your link from any video site. Next Generation Scheduling: set up complex scheduling plans, that create the right 'showtimes' for your viewers - ensuring your event NEVER becomes another video. You want to increase the reach and frequency you can market to your subscribers. You want to increase sales by selling to more people, more often. Webinar Alpha’s Smart Replay Technology Will Make It Possible To Market Anytime, Anywhere, As Often As Your Wallet Desires. Webinar Alpha’s Intelligent Engagement Features Will Make It Possible For You To Make Sales From The Same Webinar Ran Completely As LIVE As Many Times As You Want. Record Your Webinars in advance with ZERO limitations, so you can run them as live and no one will ever know. Meaning your money making webinars never have to interfere with your life or schedule ever again! You can even use existing videos - from YouTube! By using our "live locking" technology - you can take any video - and truly make it an event. That means, if someone turns up ten minutes late, they start ten minutes into your event, not at the beginning! Nothing else is more authentic! Real Time Engagement - Done in Advance! Give the ultimate ‘live’ experience for your viewers with Webinar Alpha’s when you want to boost results - with real-time chatting technology. Plus add Facebook comments for long term 'this is live' appearance. The intuitive speaker branding options and event theme browser makes it incredibly easy to style any event to look the way YOU want it. Manage Every Aspect of Your Webinar - On The Go! Webinar Alpha’s complete mobile management system offers you total control over your recorded webinar on the go because Webinar Alpha is designed to adapt to almost any device. 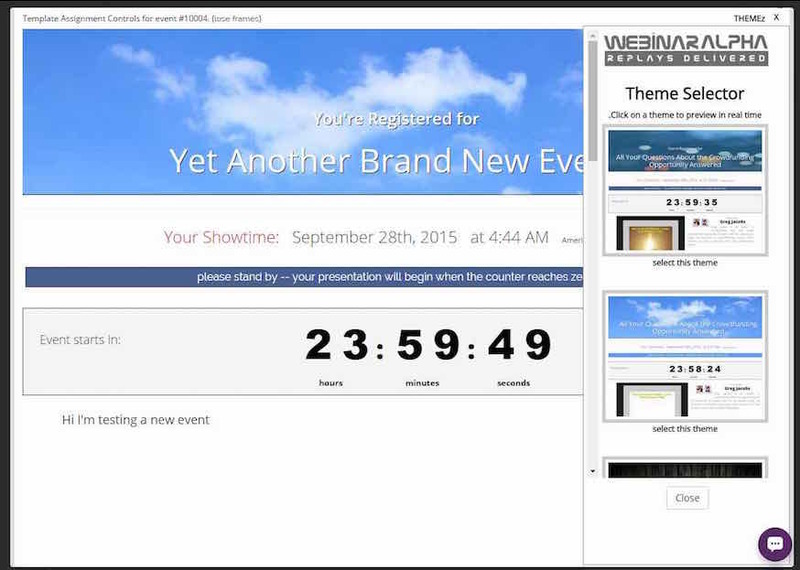 Unlike other webinar and replay system - you can choose to show your event pages on our domain, or ANY other! Use our advanced "Matinee Showtime" technology to create complex repeating event patterns. With Webinar Alpha’s branded lead gen page, and Aweber & Getreponse API integration - you capture leads. Automatically. Advanced statistics show you exactly where you can optimize your replay events to get maximum success. Simply provide Webinar Alpha with the URL of your video. That means you can setup events from your cell phone. No bandwidth worries ever again. Webinar Alpha works seamlessly with all major autoresponders including: Aweber, Get Response, Mail Chimp, InfusionSoft, SendReach, SendLane, iContact and many, many more. Webinar Alpha uses retargeting, so you can advertise to people who didn't complete your 'event' funnel. With built in email followup campaigns, sent automatically - you benefit from every last optin and sale. Using the latest breakthroughs in web technology to deliver ‘stealth automated’ webinars - without requiring advanced technical skills. Try Webinar Alpha right now, completely, utterly and 100% risk free for the next 30 days. We are utterly confident that you’ll love Webinar Alpha and the results it will provide. However, if you find that you can’t get Webinar Alpha to work for you (which is highly unlikely!) and if our robust support desk can’t fix your issue (which is EVEN MORE UNLIKELY!) then we will refund your investment = Leaving you absolutely no risk at all! So fearlessly click that and download Webinar Alpha this instant! ...Profit From Webinars - Anywhere, Anytime. Then Rinse / Repeat. As often as your wallet desires. Reaching every single one of your customers - no matter where they are in the world. With much less effort, much less work & interruption to your lifestyle. (Only when you buy Webinar Alpha during this exclusive launch period ONLY). Ok, You’ve Got Me - It’s a No Brainer. I’m In! I see the power of being able to run 'real-time' video events on the go anytime, anyplace, anywhere! I’m Utterly Convinced That Webinar Alpha Is Going To Revolutionize The Profit I Will Make From Webinars. It’s a genuinely incredible offer - and we’re actually worried that we might be giving you guys too good a deal. For This Special Offer Launch - You Can Get Perpetual Access For Less Than 1 Months Fee! Webinar Alphas is so technology rich that its extremely expensive for us to run and update. Hence why we have severely limited this price to just a 7 day launch period! Yup, that’s right, PER YEAR. And you will have to pay $297 per year. One tiny investment now, for an innovative webinar solution. As an exclusive fast action taker, you will be given free ongoing upgrades. Plus free regular webinar training to help you to utilize our new product features to maximum profitability. So what are you still reading this for? You limit the PROFITS you can make. You will have missed out on you this phenomenal offer. And much less interruption to your lifestyle. More Webinars = More Reach = More Sales = More Profits…All In LESS Time! We genuinely look forward to hearing your success stories with Webinar Alpha. P.S. You have already seen how Webinar Alpha will enable you to run more webinars, more often and get more profits with it’s revolutionary Infinity Technology, that makes it possible to run recorded webinars as live, with real-time engagement and no risk of getting caught - ALL for one small one-off investment of just $97. BUT you have just this exclusive, time-limited launch period to take advantage of this offer…and the clock is already ticking…DO NOT MISS OUT. P.P.S. For just 7 DAYS ONLY. We are giving you the unique opportunity to save yourself a ton of recurring fees on Webinar Alpha and get yourself the most innovative webinar software on the market for just a one-time investment of $97 But oncee the timer ends on this exclusive launch offer, you will have to pay $297.00 every year for our revolutionary, superior webinar system…OR revert to paying hundreds of dollars a month for other ‘big name’ webinar systems that don’t have an ounce of the functionality of Webinar Alpha. Why would you pay more, to get less? That’s right, you wouldn’t. So make the smart choice and grab your copy of Webinar Alpha. Q. Will Webinar Alpha purge my list after 90 days like Go to Webinar does? A. Absolutely not. 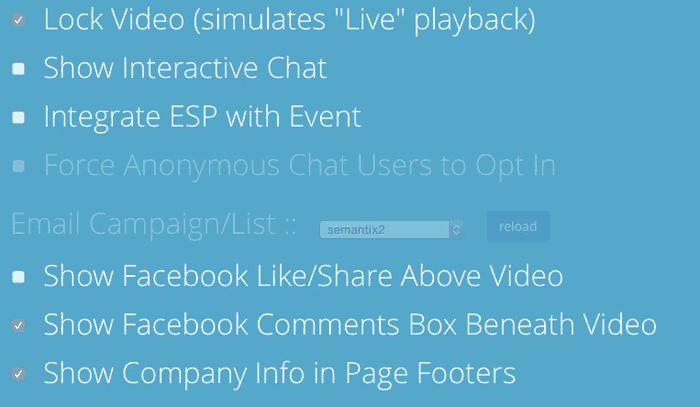 Webinar Alpha will NEVER purge your list - ever. Guaranteed. Q. Will Webinar Alpha restrict my recorded webinar videos to just WMV like other well-known webinar systems? A. Of course not! Webinar Alpha recorded Webinar videos will play on any browser for maximum compatibility. Q. Will Webinar Alpha charge me a recurring monthly fee? A. Webinar Alpha offers you a one-time investment for perpetual membership, BUT ONLY when you buy during this exclusive launch period only. Q. Why Can't I Buy The Monthly Or Yearly Options? A. We tried our best to make them great value - but we just couldn't beat the value. We know, that we prefer one off payments, versus recurring - so for this launch period only, we've gotten rid of monthly and yearly. They will return once this special offer closes, but are far more expensive, and we wouldn't recommend them to insiders! Q. How Long Is The Refund Period? A. You have a 30 Day No-Quibble Refund Period! Q. Where Can I Go To Get Support?